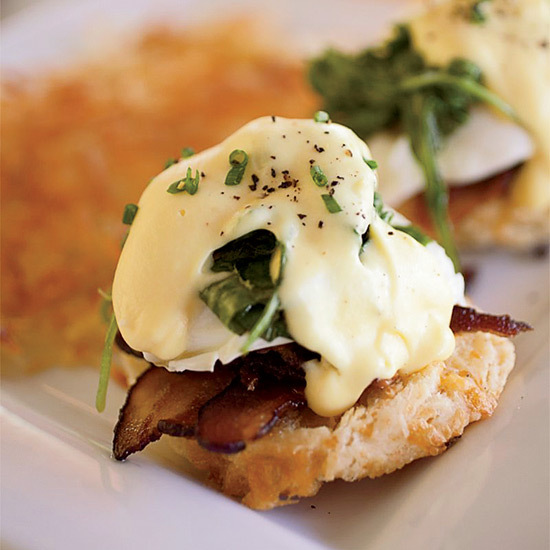 Sweet or savory, brunch is our favorite meal of the day. 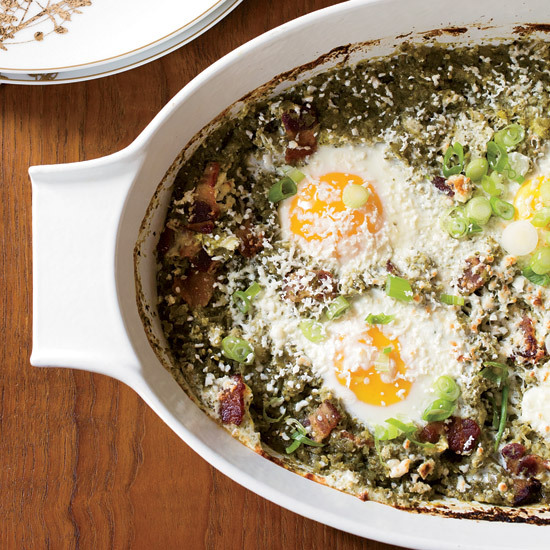 Try a new twist on a classic, like eggs benedict, or something spicy, like Mexican-inspired baked eggs. These fabulous brunch recipes include everything from gooey glazed cinnamon rolls to brunch-appropriate salads. Jen Pelka of The Riddler in San Francisco makes supercrunchy and delicious waffles using Tater Tots. 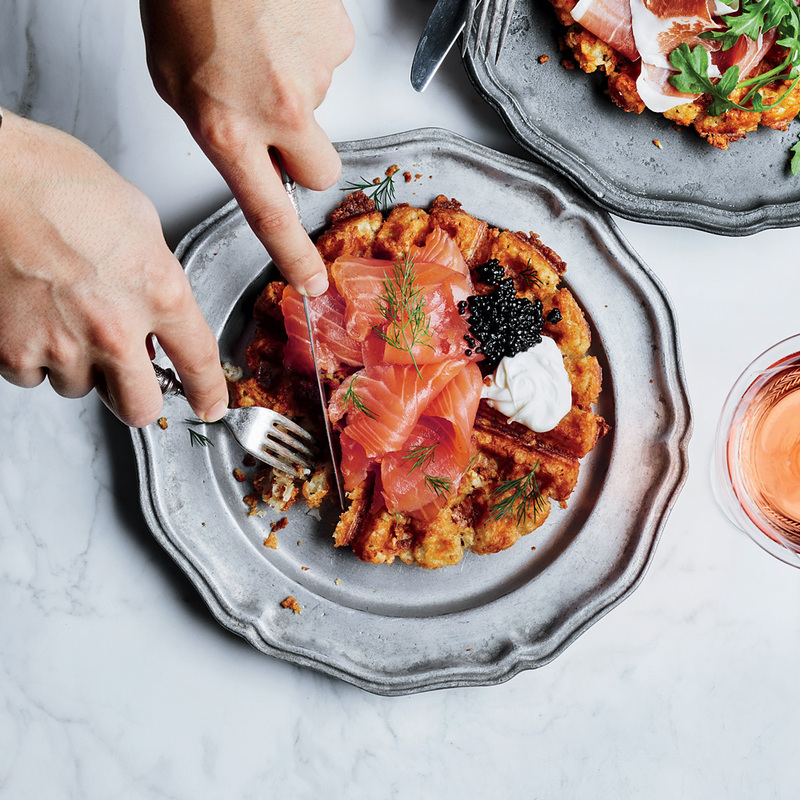 Here she tops the waffles with caviar and smoked salmon, creating a delicious and decadent dish that's ideal with Champagne. 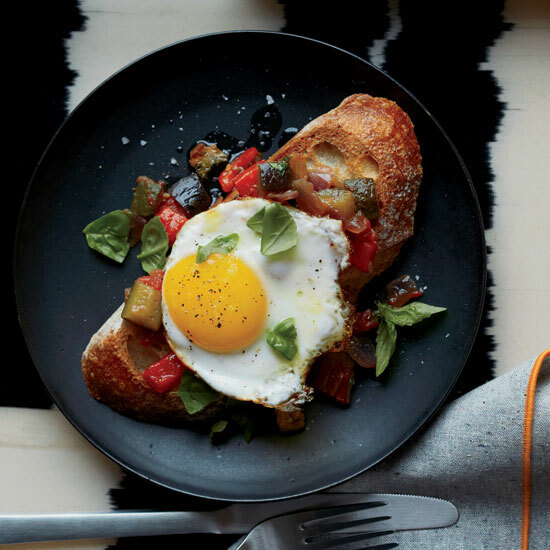 This is an ideal make-ahead brunch recipe; the luscious ratatouille tastes even better when made the day before. 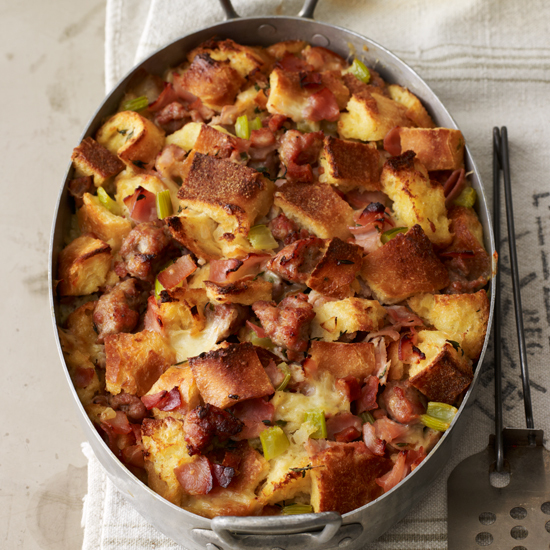 A terrific make-ahead breakfast strata from baker and pastry chef Zoe Nathan, who uses multigrain bread to add a distinct flavor to this satisfying casserole. 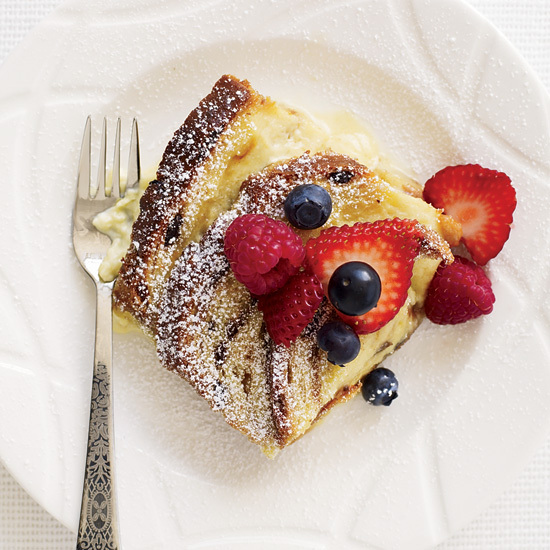 Chef Bradley Ogden’s 1987 recipe for ultrarich bread pudding is perfect for dessert or brunch. It can be made with store-bought bread, but it’s best made with a fresh bakery loaf, sliced 1/2 inch thick. 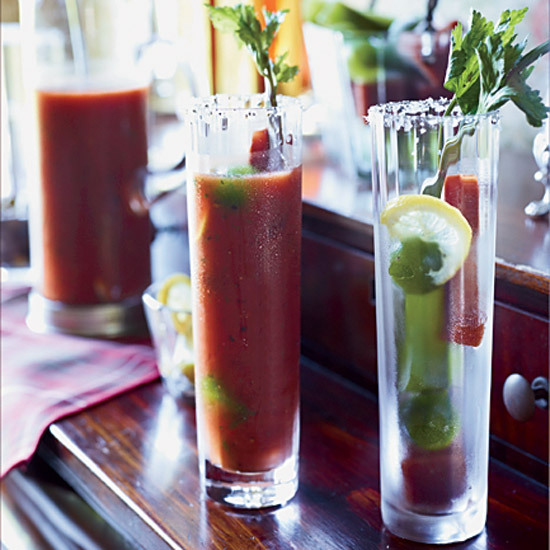 Black pepper, Tabasco and fresh chile give this delicious Bloody Mary a fiery kick. Colby Garrelts brines expensive wagyu for the homemade corned beef he uses in his tomato-rich, chunky hash. 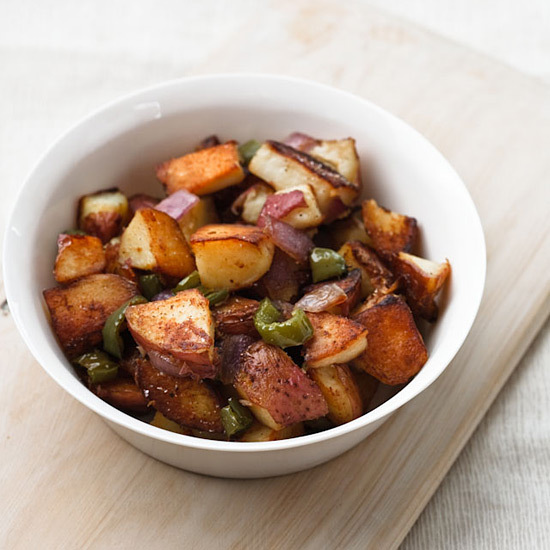 Home cooks can buy corned beef from the deli counter and cut it into thick pieces for this hash. 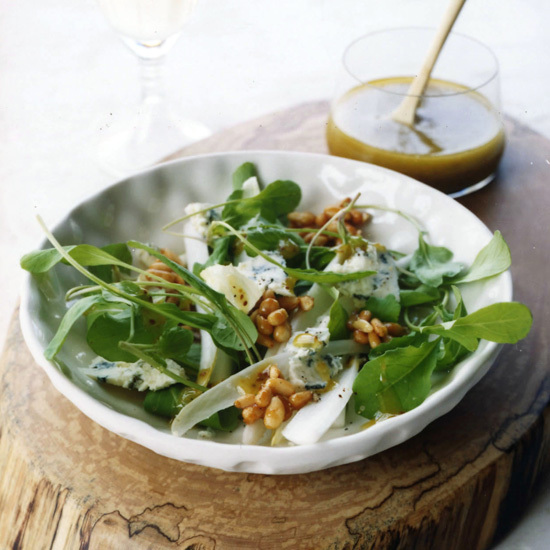 This salad reinvents the classic combination of blue cheese and honey with crumbled Maytag blue and a crunchy, brittle-like garnish made from honey and pine nuts. Pine nuts have a subtle flavor that goes especially well with milder honeys, but other nuts, like pecans and walnuts, work nicely here, too. 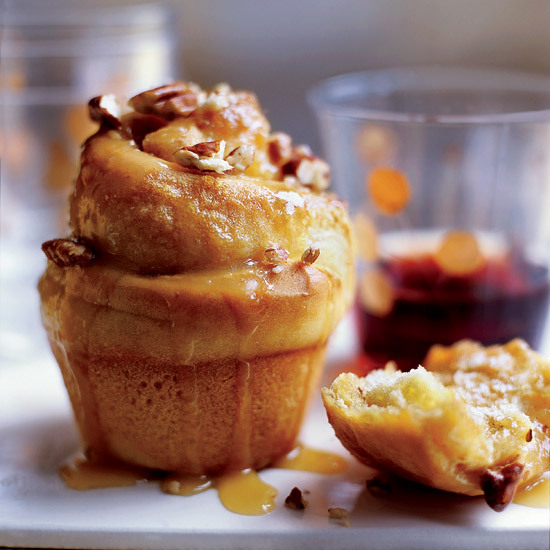 “Over-the-top, sticky, gooey goodness—or, as I like to call it, ‘love.’ ” That’s how pastry chef Catherine Schimenti describes the thrilling moment she first dipped a warm sticky bun into sweet-salty butterscotch sauce. Schimenti flavors the sauce with a splash of Scotch. 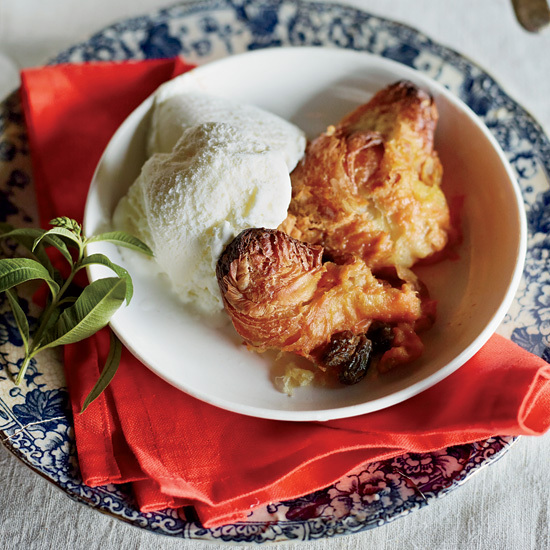 “I love adding glamour to old-school desserts,” she says. 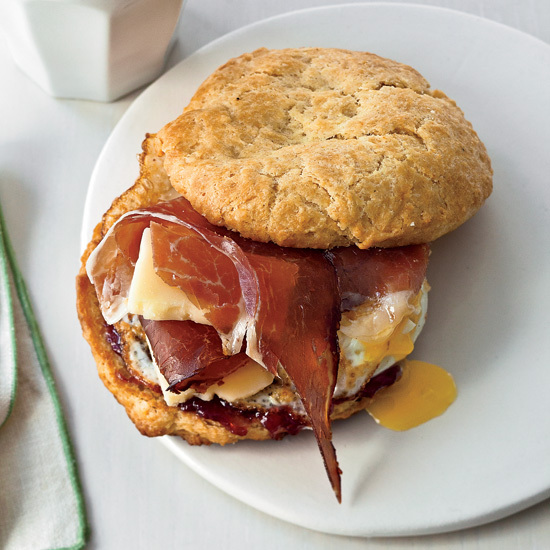 A giant step up from a fast-food breakfast sandwich, this biscuit is topped with eggs, cheese and country ham, jam optional. Bakers make traditional diplomat pudding with soaked ladyfingers or cake baked with fruit and custard. In this take, Frédéric Morin likes using the leftover croissants from Niemand Bakery. He says he always buys too much of everything, so he created this simple recipe for using up his leftovers. These muffins are easy to make: Simply mix the dry and wet ingredients separately, then combine them. 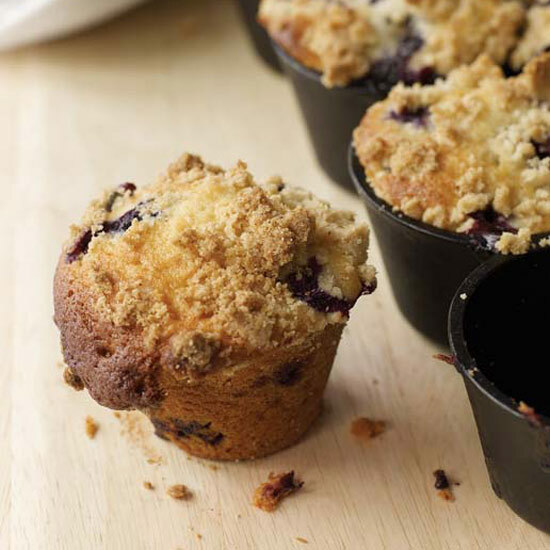 Since the baking powder, which lightens the muffins, is activated by moisture, get the batter into the oven immediately. For soft edges, use liners; for crisp edges, use a well-greased, unlined pan. You can easily replace the blueberries with other kinds of fresh fruit, such as raspberries or peaches (chopped into small pieces). 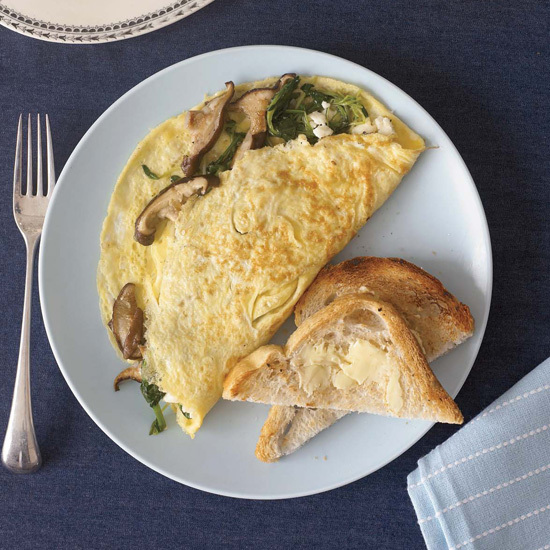 The idea for this creamy-tangy omelet comes from a fish dish often on the dinner menu at Grace Restaurant that includes some of the same ingredients here: shiitake mushrooms and delicate fresh pea shoots. 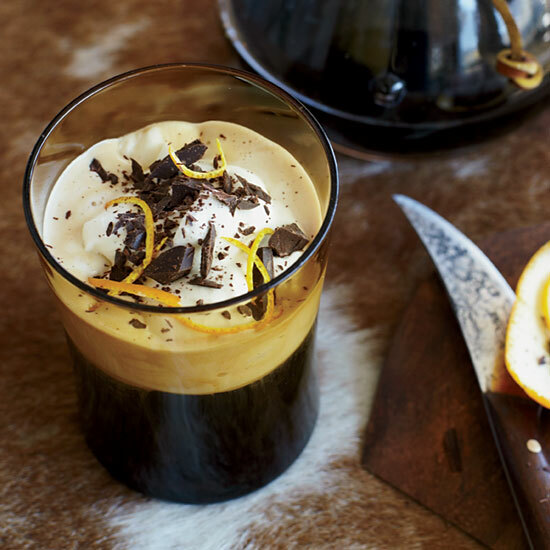 This double rum coffee is deliciously flavored with cinnamon and orange zest. 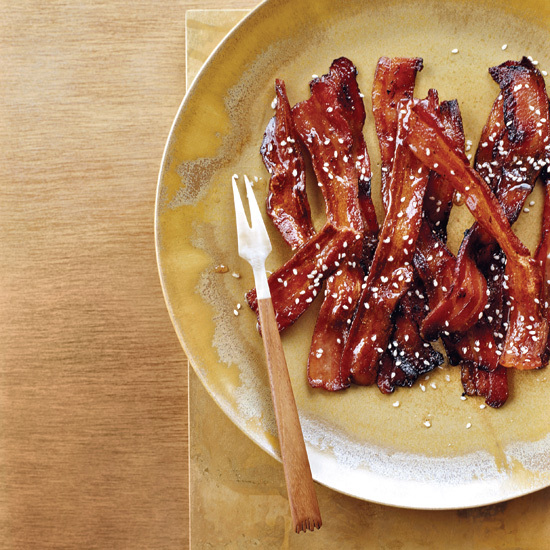 Slices of smoky bacon slathered in a spicy honey mixture are great at breakfast and addictive enough for a midnight snack. 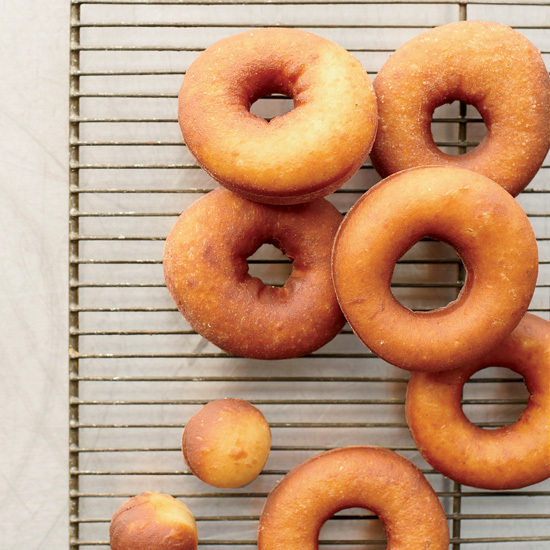 According to writer and recipe developer Jess Thomson, who helped Top Pot’s owners translate their recipes for the home cook, it’s best to weigh flour on a kitchen scale instead of using measuring cups. “When we tested the recipes for the book, that seemed to make a big difference,” she says. 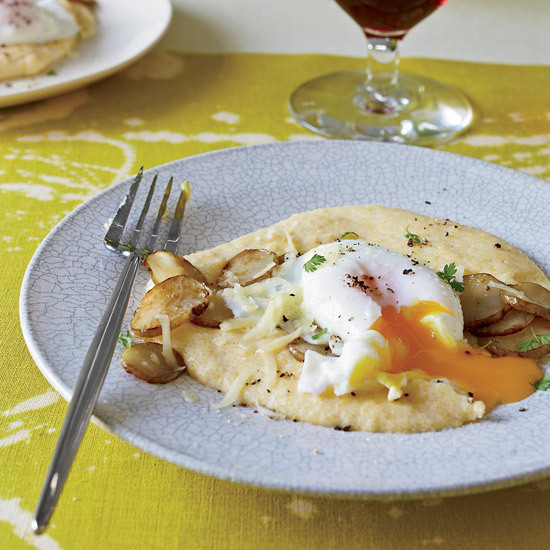 Home cooks can pair baked eggs with cheese polenta, evoking David Bouley’s Comté foam with polenta puree. 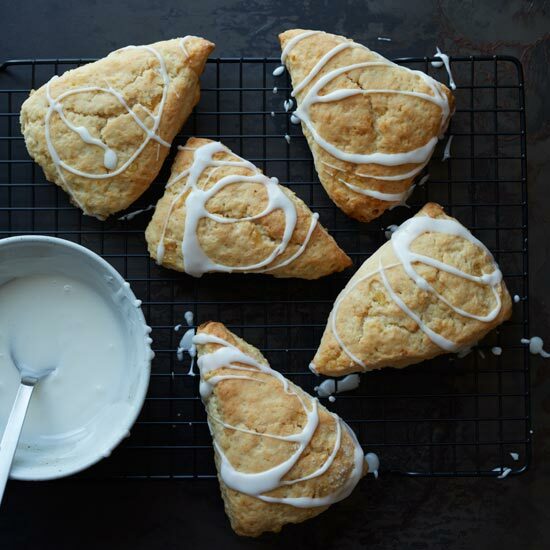 Aimee Olexy’s lemony, cream-based scones are light, moist and laced with pieces of chewy candied ginger. 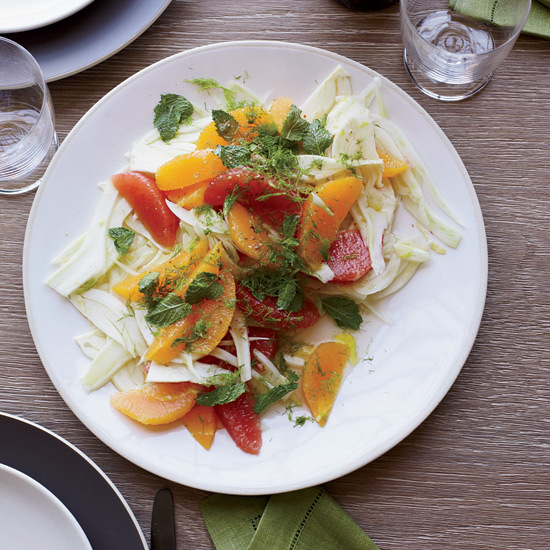 For his light, simple salad, chef Matthew Accarrino mixes grapefruit and orange segments with shaved fennel and a sweet-tart honey-lemon dressing. 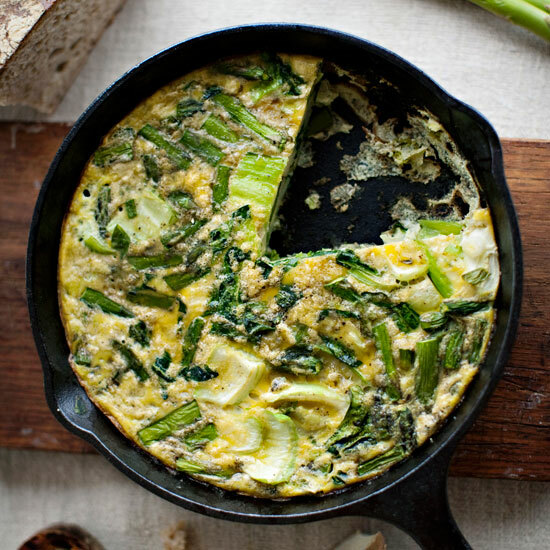 Adding parsley, chives and cheese creates a fresh-tasting, creamy frittata that is terrific warm, at room temperature or chilled. 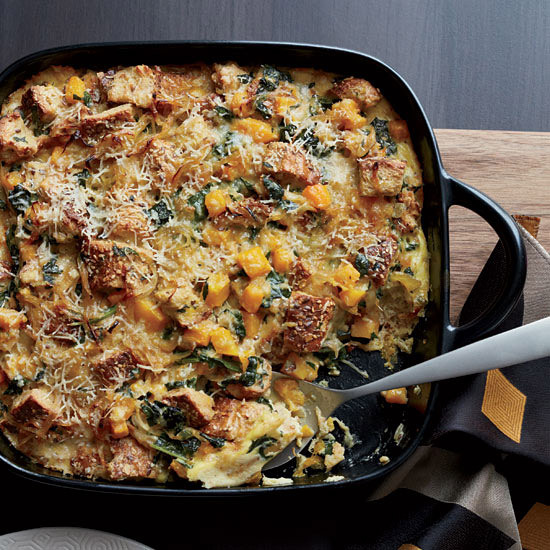 The strata needs to be refrigerated for at least 4 hours or overnight before baking, so plan accordingly. 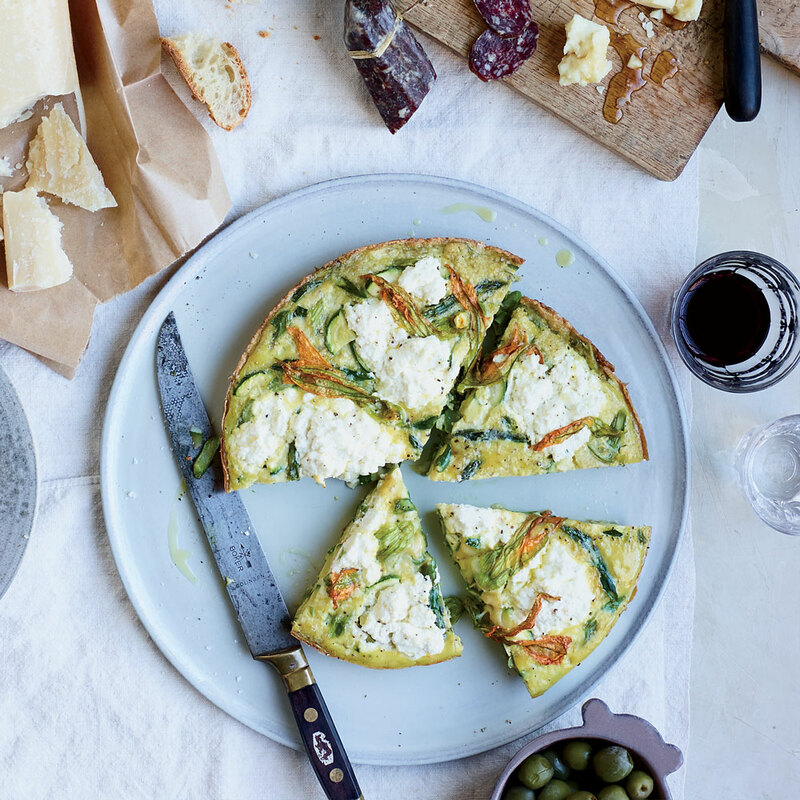 When making an Italian frittata, don’t limit yourself to traditional ingredients. The Asian flavors that fill this version offer a real change of pace. 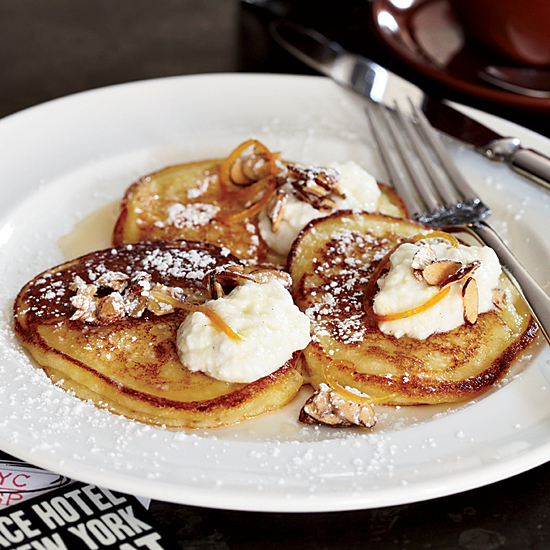 Guests at the Ace Hotel can order April Bloomfield’s pancakes in their rooms or at her restaurant, The Breslin. While the pancakes are delicious on their own, they’re exquisite with the soft ricotta topping, crunchy sliced almonds and ingeniously vibrant (and neon-bright) orange syrup. 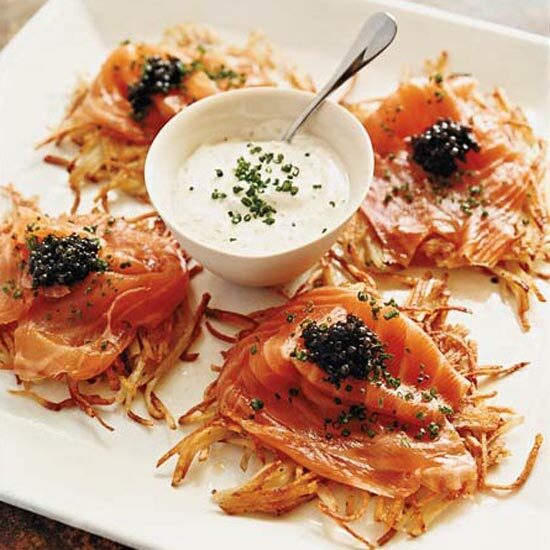 Although Wolfgang Puck is best known for putting smoked salmon, caviar and dill-flecked crème fraîche on his designer pizzas, he also loves this trio of toppings with his exceptionally crispy potato pancakes, a dish he makes frequently when cooking at home. All three garnishes are wonderfully decadent together; still, you can leave out the smoked salmon or the caviar. 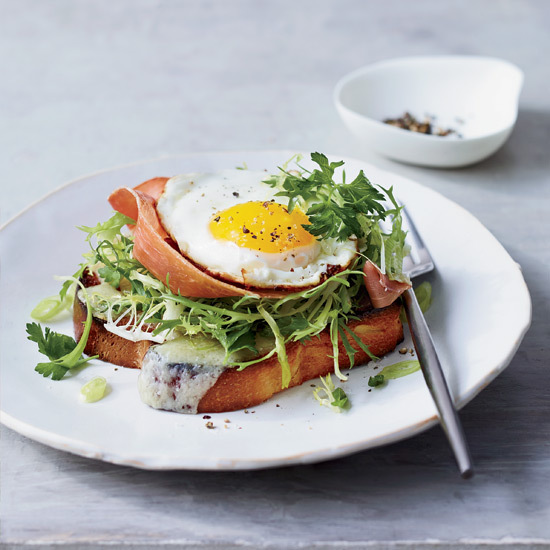 In her version of eggs Benedict, Tara Lazar swaps in applewood-smoked bacon for the usual Canadian bacon, because she prefers its rich flavor and crisp texture. 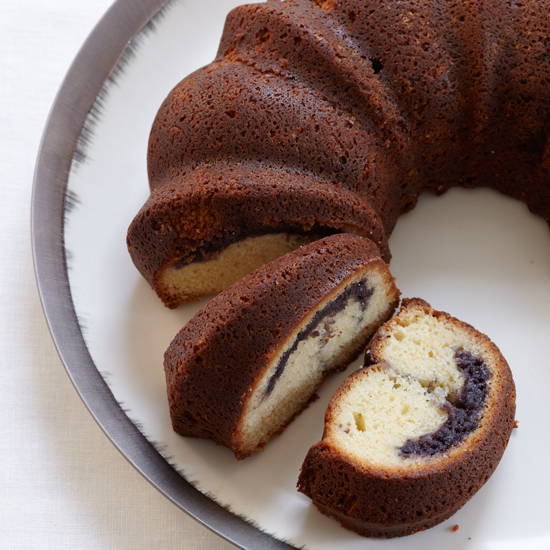 Blueberry preserves give this moist cake a pretty swirl and a fruity sweetness. 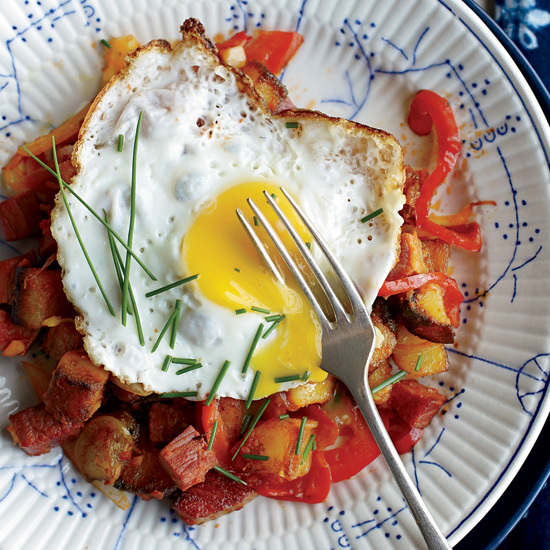 Chef Art Smith says that eating breakfast speeds up his metabolism and also fuels his intense workouts. He swears by steel-cut oatmeal, which has an appealing chewy texture. 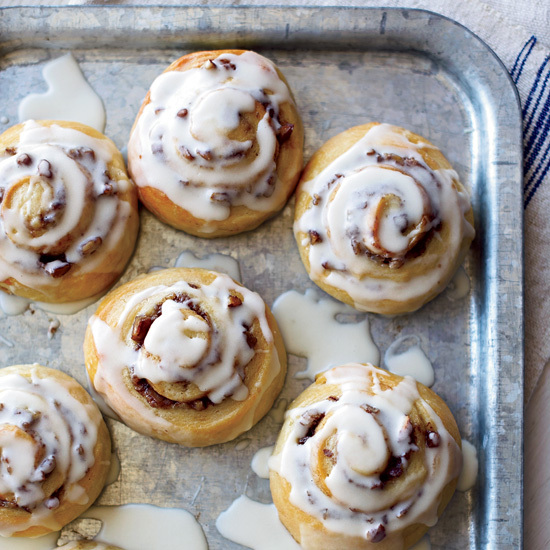 Baking these cinnamon rolls in big batches makes the effort worth it—they take time but are so satisfying. Few Americans eat pasta for breakfast, but this Greek-inspired recipe with orzo, leeks and bacon aims to make a few converts. 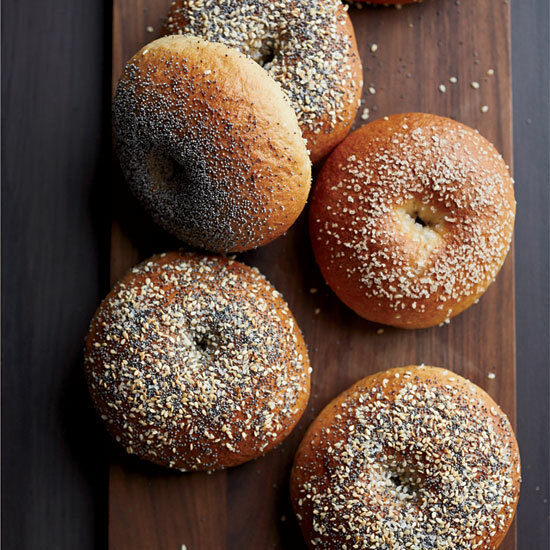 The trick to these crisp, chewy bagels is the poolish, a fermentation starter (also known as a mother dough) made with bread flour, yeast and water. It is quickly assembled the night before the bagels are made. 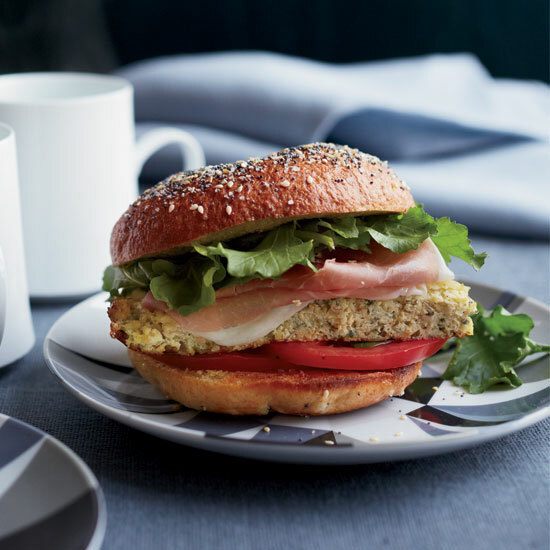 F&W's Justin Chapple poaches a dozen eggs at once in a muffin pan in the oven, making his cute and tasty breakfast sliders extraordinarily easy to prepare for entertaining. 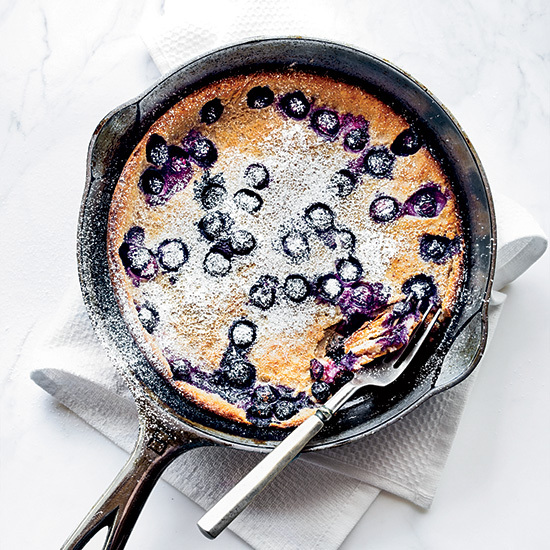 Cookbook author Ben Mims uses pomegranate juice to sweeten the batter for this light and berry-rich pancake. For brunch chef Adam Schop sprinkles shredded coconut onto his pancake batter; when the pancakes cook on the griddle, the coconut gets nicely toasted. 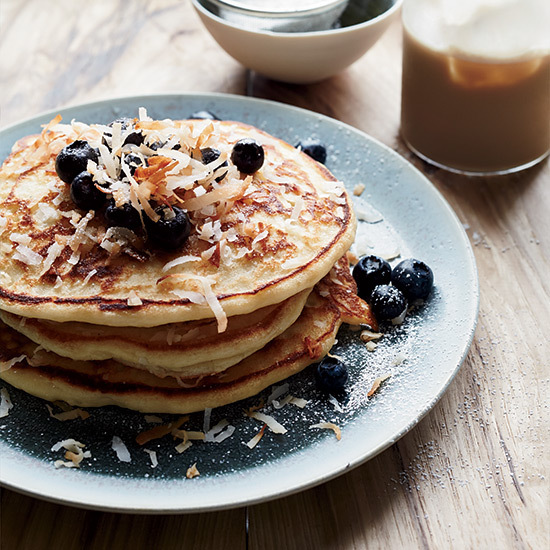 The finished pancakes get a layer of extra coconut before serving. 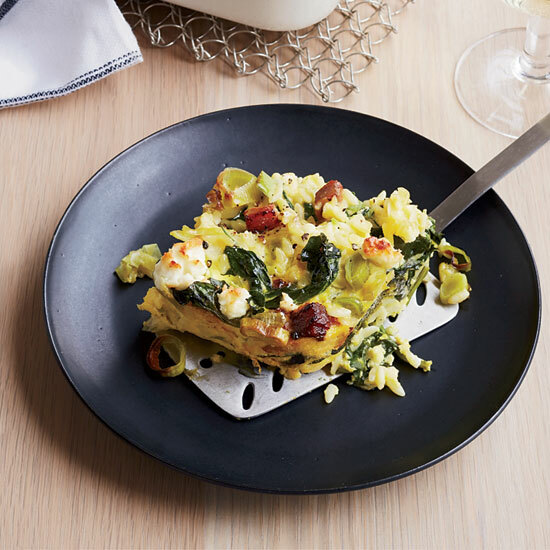 Chef Chris Behr’s versatile frittata with crisp spring vegetables can be eaten warm or at room temperature. Serve for brunch with an accompanying platter of crusty bread, fresh fruit, cheese and salumi, or for lunch with a green salad. 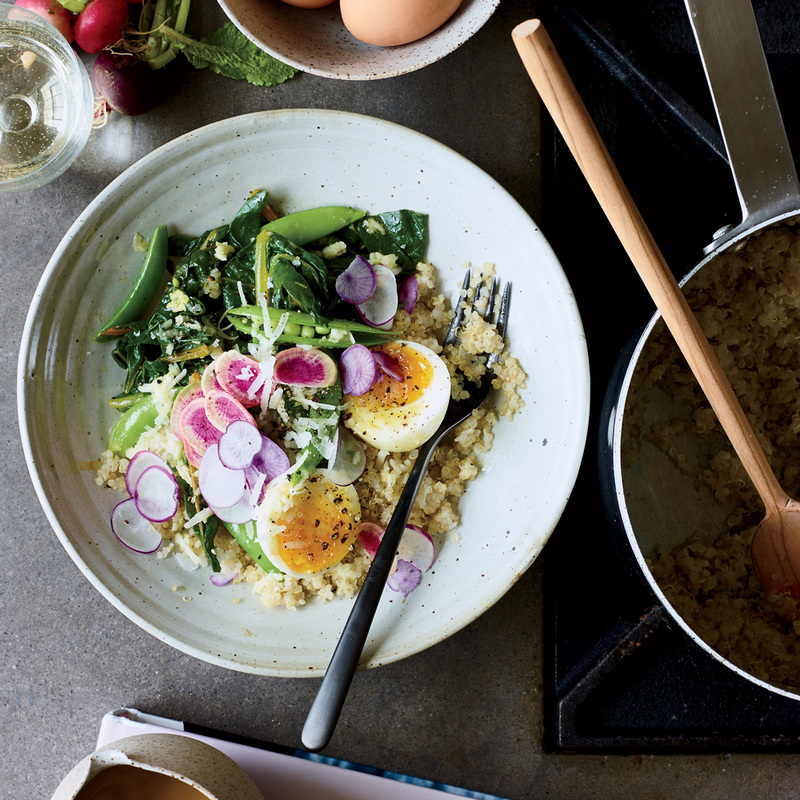 Cookbook author Melissa Clark takes inspiration from Caesar salad in this quinoa bowl, which includes a soft runny egg and a lemony, cheese-spiked dressing. 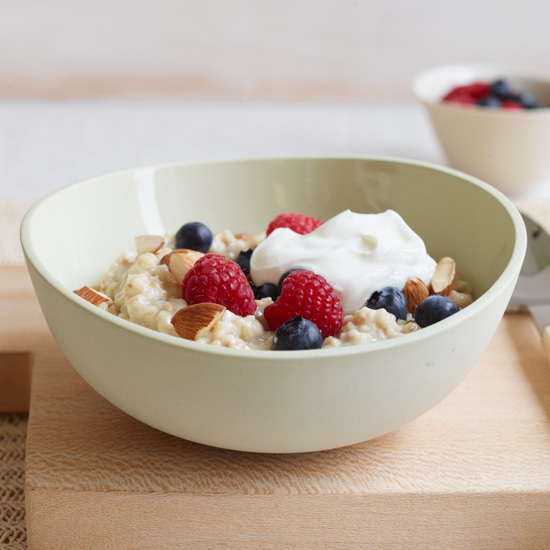 It’s one of the best grain bowls we’ve ever had.